The Story Bridge Night Climb is an adventure experience with a difference and the most spectacular way to discover Brisbane. Incredible views of the city light and delights! The Story Bridge is an iconic part of the Brisbane landscape and the opportunity to climb it is not one to be missed. Brisbane Story Bridge Adventure Climb is an adventure experience with a difference and the most spectacular way to discover Brisbane. 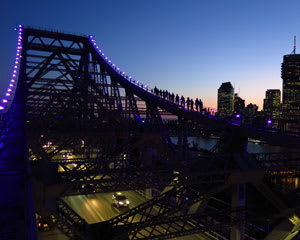 Whether you are a local or a visitor, you'll be exhilarated by a once-in-a-lifetime bridge adventure climb that offers you a glittering panorama of Brisbane and her surrounds lit up by the city lights. The views from the top are breathtaking and will give you a whole new appreciation for Brisbane. If it’s a gift and you don’t know when they want to go, instant gift vouchers are available so they can choose the date. Book now for a new perspective on Brisbane! Before you climb: Avoid alcohol. Story Bridge Adventure Climb reserves the right to breath test all climbers. You will need to complete a declaration form and satisfy Story Bridge Adventure Climb's terms and conditions. Sam, our guide, was awesome. He looked after everyone with respect and humour. Riley and Maddy were in charge - great energy and great hosts. Well done! A huge thank you to Riley. He was a great tour guide, explained everything extremely well. Absolutely fantastic experience! I would highly recommend it! Well organized, great fun. Our guide Felicity did a great job!